We provide a wide variety of electric screwdrivers and equipment. We can help you with handheld, automatic, pneumatic or electric screwdrivers; complete Lean Manufacturing Cells, or components only. Whatever functions you perform, MCI has the experienced personnel, manufacturing capability, and patented equipment to get the job done. Our engineers can assist you in creating the package of electric screwdrivers that out performs any other equipment on the market. We have the decided advantage of manufacturing all of the components that make up your system, rather than forcing your system into a canned package. We also stock replacement parts for all of our systems, so there is no need for you to spend the time and manpower to keep an inventory of spare parts for your electric screwdrivers. 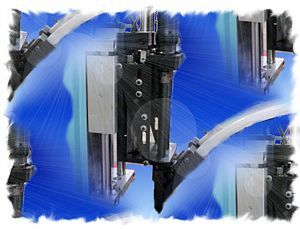 We would be pleased to submit a quotation on a package that meets your automatic screwdriving requirements. Please contact one of our consultants by E-mail, or call us at 317-776-1970. MCI/Screwdriver electric automatic screwdrivers provide unmatched capability when driving small screws into metal or plastic in industrial assembly applications. Without the need for plant air supply, our broad platform includes models offering enhanced ergonomic designs and grip surfaces, ESD-safe housings. Recommended for assembling with small screws in metal or plastic where precise torque control is required, these automatic screwdrivers offer excellent fastening capability and a broad range of options and accessories. With torque coverage from 0.3 to 40 in-lb and speeds to 1850 rpm, precision shut-off screwdrivers are available in pistol, inline, and angle configurations. MCI/Screwdriver Systems product line of automatic electric fastening screwdrivers includes light weight electric tools that are economical, ergonomically friendly, and compact, weighing three pounds, or less. MCI Automatic Screwdrivers are designed with optional adjustable clutch torque control from .10 - 2.94 Nm. AC or DC models available from 470 - 2000 RPM's. MCI/Screwdriver System's automatic electric screwdriver product line includes multiple accessories which enhance function and ease of use. Our electric automatic screwdrivers are available in custom and off-the-shelf models. MCI/Screwdrivers electric fixtured and hand-held screwdrivers are industrial quality and stocked for prompt delivery. These models generate motor speeds between 470 and 2000 rpm and torque capacities of 0.02 to 4.41 Nm for a wide range of screw driving applications. MCI/Screwdriver automatic electric screwdrivers are designed to accept either a single or double ended 6.35 mm (1/4") hex power drive bits. These long life bits are very dependable when applied through a wide range of torque requirements. The torque accuracy is held to � 2.5%. MCI/Screwdrivers DC Automatic Electric Screwdrivers and Controllers are UL listed and are ideally suited to drive fasteners into electronic components and other high production applications. Our ergonomic design provides lightweight automatic screwdriver and nut driving tools designed for long life and dependablilty in harsh production envoronments . Either a single or dual port DC controllers are used based on the application. MCI/Screwdriver automatic nut drivers and screwdrivers are availale with torque ranges from 0.02 to 1.57 Nm. Motor speeds are available from 470 rpm to 1000 rpm. Both lever and push-to-start options are available. All DC model screwdrivers are fully automatic in that the motor shuts off when the clutch, or transducer disengages. Torque settings are easily adjusted to fit each unique production requriement. MCI/Screwdrivers DC Automatic Electric Screwdrivers and Controllers are UL listed and are ideally suited to drive fasteners into electronic components and other high production applications. Our ergonomic design provides lightweight automatic screwdriver and nut driving tools designed for long life and dependablilty in harsh production envoronments . Either a single or dual port DC controllers are used based on the application. MCI/Screwdriver automatic nut drivers and screwdrivers are availale with torque ranges from 0.15 to 4.42 Nm. Motor speeds are available from 470 rpm to 1800 rpm. Both lever and push-to-start options are available. All DC model screwdrivers are fully automatic in that the motor shuts off when the clutch, or transducer disengages. Torque settings are easily adjusted to fit each unique production requriement. MCI/Screwdriver Systems offers a wide selection of standard accessories, and miscellaneous equipment for our entire line of automatic nut driving and screwdriving mechanisms. These product accessories allow you to easily adapt your equipment to meet our customer's assembly requirements such as Torque Meters, Power Controls, Replacment Bits, Bit Adaptors, Torque Fixing Rings, Tool Hangers, Postol Grips, Angular attachments, and Tool Balancers.